Gift wrapping can make or break a floral design – it is the first thing that you notice. No matter how beautiful your display is if you wrap it badly, it will lose its impact and the recipient won’t get the same joy and excitement from it as if it had been beautifully wrapped and trimmed. Flowers are a luxurious item, they are a treat and sometimes a complete surprise, and should be treated as such so it’s worth taking time to practice your gift wrapping because you don’t want all your hard work to go to waste. These days you can buy gift wrapping from the floral wholesalers. These can be ready made circles of cellophane with holes in the middle through which you place the stems; or colourful boxes in which to place your bouquet or single flower. Boxes in particularly can look lovely with some tasteful ribbons and bows. It is worth bearing in mind that not only can gift wrapping make an arrangement look fab, it can also protect the flowers and makes handling a lot easier. Hand tied bouquets which are aqua packed (wrapped with the stems in water) are very popular because all the recipient has to do is place the display in a vase – no other effort involved. They are also very popular with florists as they can be made in advance because the flowers will have a ready supply of water – ideal during busy periods. This type of bouquet can either be finished off with a bow or placed in a box which is trimmed. Using a jug add water carefully into the centre of the bouquet to about two inches below the tying point. A bow can add a touch of glamour and vibrancy to any gift wrapping – but, like the gift wrapping itself, it has to be perfect otherwise it can ruin even the best floral efforts. Perfecting your bow-making skills does take time and effort, but once you’ve got the hang of it, it can set you apart from other florist whose technique mightn’t be as good! A beautiful bow is a fabulous adornment to complete gift wrapping your flowers, or adding something special to a bridal bouquet. It can adorn sympathy tributes, handtied posies, baskets and Christmas garlands, and the good thing is that you can make them in advance and store them up for peak periods such as Valentines Day or Mother’s Day. 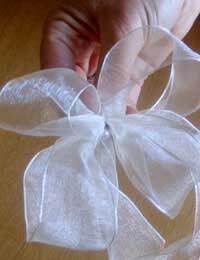 There are many ways to create a bow depending on the type of ribbon you are using and the type of effect you are after.For the majority of types of ribbon such as satin, paper, raffia, organza etc, the “figure of eight” method is generally regarded as the best and most versatile as it gives the ribbon a wonderful fullness. Cut the required length of ribbon depending on your bow size and hold it firmly between your thumb and fore finger, leaving a length to trail down. Fold one end to make a loop – again gathering it between your thumb and forefinger. Repeat this process and then make two further loops ensuring that all are equal size. Secure the bow tightly in the middle using binding wire. It is now ready to be attached onto your display. This is usually done by tying the binding wire holding the bow together onto a piece of ribbon tied on or around the display. Once you’ve gift wrapped and trimmed your arrangement with a bow always secure on a message card placed in an envelope. A care card and flower food should also be included. These are available from a florist wholesaler.